Valentine’s Day has technically passed, so all you single people can breathe a sigh of relief and all you non-single people can also breathe a sigh of relief because the pressure to give into capitalism has maybe lessened a little. Depending on who you are, of course. 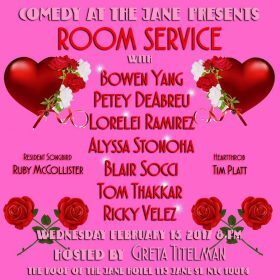 But if you’re longing to stay in the spirit of flowers, chocolates, and a pink n’ red color palette, this edition of Greta Titelman’s Room Service comedy show at The Jane has got you covered. With a lineup full of love-worthy folks like Bowen Yang, Lorelei Ramirez, Alyssa Stonoha, Petey DeAbreu, Blair Socci, Tom Thakkar, and Ricky Velez, you’ll be sure to spend the night feeling warm inside, expelling laughs from your gullet in only the most loving of fashions. Rounding out the bunch will be two individuals aiming their Cupid’s arrow in a more musical way: Ruby McCollister and Tim Platt as “resident songbird” and “heartthrob,” respectively. Comedy roasts can be stressful. Or liberating, perhaps: instead of hiding your laughter when someone makes fun of someone, you can do so openly and proudly. However you’re feeling about roasts, these feelings might be improved with the addition of cocktails and fancy dress… Or not. 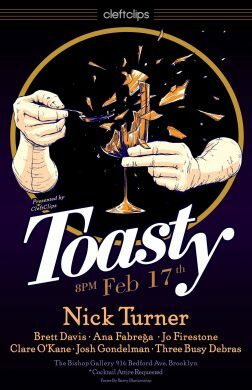 Introducing Toasty, a new show that’s part cocktail party, part “elegant free form roast of strangers.” The whole affair will be hosted by Nick Turner (Comedy Central), and the lineup of distinguished guests that will be taking these strangers to task while sipping dainty drinks includes Brett Davis, Ana Fabrega, Jo Firestone, Josh Gondelman, Clare O’Kane, and out-there trio Three Busy Debras. 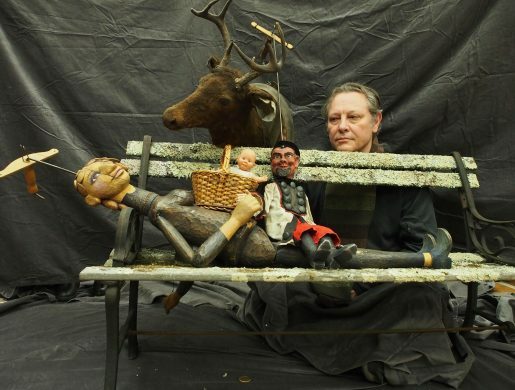 It’s hardly surprising to see a modern theater artist taking on plays from days of yore, especially Greek tragedies. Nowadays, all-female casts replacing mixed or all-male ones are also nothing new. However, it’s less common to see an all-female adaptation of a Greek tragedy that is also a riot grrrl-inspired punk musical. Seonjae Kim’s newest creation Riot Antigone does just that, taking the classic story of a fiercely loyal woman up against incredible odds and adding electric guitars, flannel, leather, and a whole lot of badass women in order to breathe new life into an old myth. Plus, this is the last weekend to catch it.